Tmart is a Chinese supermarket that offers a very wide assortment of products, practically for all occasions you could ever think of. The majority of items, as always, consist of different electronic devices as well as gadgets. There are more than 20 000 items divided on 100 categories offered in the Tmart internet-shop. In the "Daily Deal" section you can find sales every day. There is also a fixed proposal (that may rise up to 50% off the price) – one of the items is offered with a huge discount for every 24 hours. Moreover, the item that is to be chosen for the next day is being picked out by the guests of the site by vote. Furthermore, you can buy as much of those items under discount as you want, there is no limit. If the order is more than $15 you have a chance to choose a free present. This gift depends on the amount of your purchase. 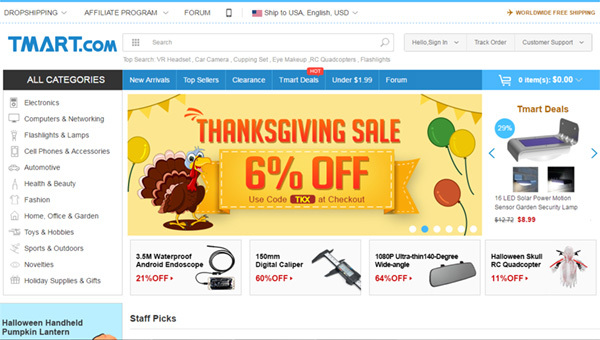 Tmart.com has a brilliant reputation among western buyers because it has a great variety of products as well as very pleasant prices and is known for its good attitude to the clients. The shop has three warehouses: in the USA, Great Britain and Hong Kong, the purchases are mostly sent from the last one. There are discounts on small wholesale shipments, but they are not very big. The airmail delivery is free on the whole range of the items. You can also choose an express delivery with tracking option, but only for extra payment. The price is going to be counted while you order. I like TMart a lot. I have ordered from them many times with few problems. Their customer service is wonderful, quick and efficient.